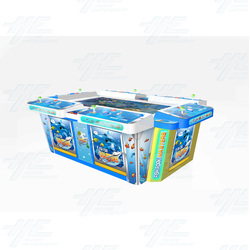 The Fish Fork Master Arcade Machine is a 6 player ticket/video redemption cabinet which has a marine theme and loads of engaging and rewarding features. In Fish Fork Master the aim of the game is to catch as many fish as possible, and more higher value fish if possible, in order to earn points and collect tickets. This game actually puts players in direct competition with each other, while still being able to enjoy to the single style play of the game, and rewards players for ranking well against other players. Players have a set amount of time in which to catch fish and there is no limit on how many fish you can catch in this time. At the end of the game the points will be calculated and players will receive their earnings. To start playing Fish Fork Master players simply insert their coin/token, etc. into the machine and can start the game. Using the joystick, players control a net gun and they can swap between various weapons, such as the Shotgun Harpoon or Super Harpoon, at any stage during the game. Players then simply line up a target and hit the Shoot button, getting points for each fish the shot damages or catches. Fish Fork Master also has a number of mini games and features for players to enjoy, and the more you play, the more these features will appear. These features include: Contagious Fish, Electric Eel, Floating Light Bubble, Fish Spearing Competition, Overtime props, Super explosion, and No-work boots. At the end of the game, the points will be calculated and the tickets will be paid out. The game also has this unique new feature where it performs a ranking for each player, displaying the top 10 in front of each panel. If a player’s single play gets him/her to the ranking board, he/she will earn extra tickets! Some characters include the Butterfly Fish, Clown Fish, Squid, Lantern Fish, Lion fish, Flying Fish, Hammerhead Shark, Fugu, Tiger Shark, Flat fish, and more! The Fish Fork Master is a great game with loads of fun features, cool fish characters to catch and amazing undersea scenery. The simple game play is made more challenging with optional and random game features making it suitable for players of all ages and skill levels. In Fish Fork Master the aim of the game is to catch as many fish as possible, and more higher value fish if possible, in order to earn points and collect tickets. This game actually puts players in direct competition with each other, while still being able to enjoy to the single style play of the game, and rewards players for ranking well against other players. Players have a set amount of time in which to catch fish and there is no limit on how many fish you can catch in this time. At the end of the game the points will be calculated and players will receive their earnings. To start playing Fish Fork Master players simply insert their coin/token, etc. into the machine and can start the game. Using the joystick, players control a net gun and they can swap between various weapons, such as the Shotgun Harpoon or Super Harpoon, at any stage during the game. Players then simply line up a target and hit the Shoot button, getting points for each fish the shot damages or catches. Fish Fork Master also has a number of mini games and features for players to enjoy, and the more you play, the more these features will appear. These features include: Contagious Fish, Electric Eel, Floating Light Bubble, Fish Spearing Competition, Overtime props, Super explosion, and No-work boots. At the end of the game, the points will be calculated and the tickets will be paid out. The game also has this unique new feature where it performs a ranking for each player, displaying the top 10 in front of each panel. If a player’s single play gets him/her to the ranking board, he/she will earn extra tickets! Some characters include the Butterfly Fish, Clown Fish, Squid, Lantern Fish, Lion fish, Flying Fish, Hammerhead Shark, Fugu, Tiger Shark, Flat fish, and more! The Fish Fork Master is a great game with loads of fun features, cool fish characters to catch and amazing undersea scenery. The simple game play is made more challenging with optional and random game features making it suitable for players of all ages and skill levels.